A Bedazzled [kind of] Life: 80. Priscilla of Boston breaking news! 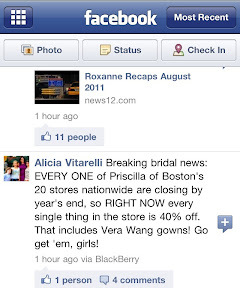 As I said on DDOW's Facebook page earlier Priscilla of Boston is going out of business at the end of 2011 and they have currently put all their stuff on sale for - get this - 40% off !!!!!! All I can say is wow knowing how gorgeous their dresses generally are. I will have more information for you as I research into this amazing alert! PS I love blogging sans computer!!! What do you think?